Molly Bloom reveals how she built one of the most exclusive, high-stakes underground poker games in the world – an insider's story of excess and danger, glamour and greed. Molly Bloom formed the most elite high-stakes poker game Hollywood had ever seen – she was its mistress, its lion tamer, its agent, and its oxygen. Everyone wanted in, few were invited to the table. In the late 2000s, Molly Bloom, a twentysomething from Loveland Colorado, ran the highest stakes, most exclusive poker game in existence. Hundreds of millions of dollars were won and lost at her table. Molly's game became the game for those in the know-celebrities, business moguls, and millionaires. Molly staged her games in palatial suites with beautiful views and exquisite amenities. She flew privately, dined at exquisite restaurants, hobnobbed with the heads of Hollywood studios, was courted by handsome leading men, and was privy to the world's most delicious gossip, until it all came crashing down around her and she lost everything. 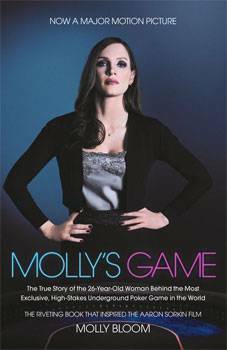 Molly's Game is a behind the scenes look at Molly's game, the life she created, the life she lost, and what she learned in the process. Molly Bloom grew up in Loveland, Colorado. She attended the University of Colorado at Boulder, majoring in political science. For several years Molly organized one of the largest high-stakes poker games in the country. She currently lives in Los Angeles. Review: Molly's Game is an intriguing and easy read that I'd highly recommend even if you've seen the movie, if only for the name-dropping alone (I'm talking Tobey Maguire, Ben Affleck, Nelly, Leonardo DiCaprio and more). It's important to note, Molly Bloom was discrete in her naming of celebrities and has only used those who are already on the public record for participating yet paints a thought-provoking picture of those named. I didn't know of Molly's story prior to reading this memoir which explains why I found it so impossible to put down. Even if you're not a fan of memoirs', I'd recommend the book for its portrayal of a very motivated female in a male-dominated world. Molly's Game is a compelling read due to the pure fascination of Hollywood's Poker scheme whilst still being elegant and allowing the reader to escape to a world of money, design and power.